Pandoro: Pandoro is traditional Italian sweet yeast bread, most popular around Christmas and New Year. The biga (starter)used for Pandoro helps keep it fresh right through the 12 days of Christmas! Pandoro is traditionally shaped like a frustum with an 8 pointed-star section.It is often served dusted with vanilla scented icing sugar made to resemble the snowy peaks of the Italian Alps during Christmas. Pandoro was also the last meal eaten by the Italian dictator Benito Mussolini before his execution in 1945. Note: Biga (Starter) should be prepared 12 hours earlier or the night before making Pandoro. Mixture will be fairly smooth and very stiff. Cover and rest for at least 12 hours or overnight. Combine the bread ingredients, except for raisins and apricots in a bowl. Add in the biga (starter) to the bread ingredients mixture. Mix well –by hand, mixer or bread machine, till no lumps are formed. Knead the dough (by hand, mixer or bread machine), till a soft, very smooth dough is formed. Cover the dough with plastic wrap. Keep the dough in a warm place to rise, for 1 hour. Knead the golden raisins and diced dried apricots into the dough, trying to leave most of it inside. Any fruit on the surface will tend to burn as the loaf bakes. Knead the dough into a round shape. Transfer the dough to a lightly greased pandoro pan. Allow the dough to rise, covered, for 2 hours. The dough will become noticeably puffy, but won’t fill the pan. Preheat the oven to 350°F towards the end of the rising time. Bake the bread for 10 minutes. Tent it lightly with aluminum foil. Bake for an additional 35 to 40 minutes, until its interior temperature measures 190°F on an instant-read thermometer. Remove the baked pandoro from the oven. Gently remove it from the pan. When cool, sprinkle the bread with confectioners’ sugar or non-melting white sugar. Pandoro is ready to be served. 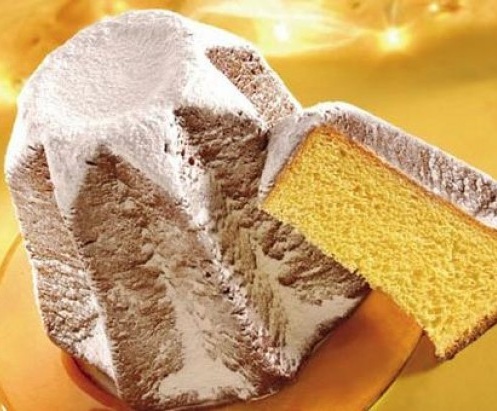 Serve the pandoro, sliced, with mascarpone cheese, if desired.